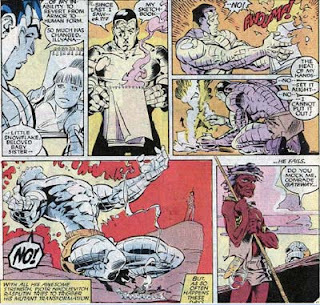 Uncanny X-Men #231 "...Dressed for dinner": Colossus is struggling with many issues, the most obvious of which is his inability to revert to his human form. In the heat of the Australian Outback, this almost proves very dangerous to him when Rogue seeks to comfort him. His one outlet, drawing, is betrayed by his heated hands, which sets a picture of his sister on fire. The intensity of his emotional pain was so simply and beautifully drawn in these few panels, with Gateway quietly not watching near by. Storm comes next to offer comfort, but ultimately, the team sees that the only way to ease his pain is to let him see his sister, whom he's been having nightmares about. Conveniently, Illyana is in the middle of conjuring a shade of her brother, which Gateway's portal drops him into the middle of. His interactions with his sister, all while having to pretend that he is merely a conjuring, are all so Big Brother, Little Sister sweet. CIRCLE OF BLOOD: Japan. The future. A new age of corporate feudalism. The worlds of business, organized crime, and politics now exist in a delicate interdependence. Enter the Noh, a government agency that secretly polices that balance of worlds. Kabuki, an operative of the Noh, becomes deeply affected by the death of her mother and can only relate to the world through the safety of a mask. She embarks on a quest to come to terms with her family, history, culture, and her mother’s death …even if her personal crusade brings her in direct conflict with the powers she serves. A mix of historical mythology, political intrigue, corporate espionage, and familial duty, elegantly told through the haunting lens of a child's fairy tale. The first chapter in one of the most critically acclaimed comic series of the nineties. I don't recall how I picked up Circle of Blood, since at the time, I was more likely to follow art, and this was initially black and white, with mainstream style artwork that didn't immediately grab me. After this story arc, Mack's approach changes, both in writing and in art. He spends time exploring the intricacies of Kabuki's broken mind as well as providing more depth on the other Masks of the Noh, all through incredible use of words to paint pictures and paintings to create words. It is impossible to read this comic only once, lest you miss something hidden in the beautiful prose. I've had Kabuki on my to-read list, but I just gotta get around to reading it. I have them, but I always end up getting distracted by something else that I want to read. Such is the life of the bibliophile.